The Royal Automobile Club was founded in 1897 and was first brought to light when it introduced the 1000 mile trial in 1900. The race still remains the oldest continuous competitive motor sports event. Since then it has gained a royal title and has had praise from politicians, celebrities, business people and royalty itself. 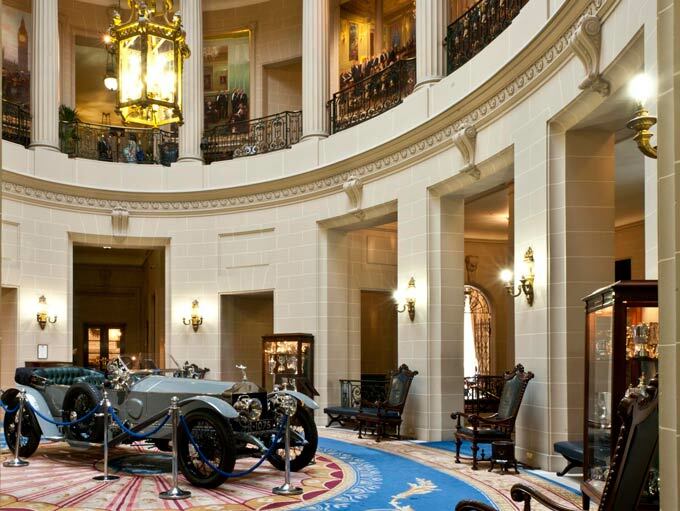 Although The RAC club will always be famous for its motoring background, its Pall Mall clubhouse now hosts first-class accommodation, dining and sports facilities. The clubhouse itself holds 200 events each year, from motoring shows to live music. With 15 function rooms, 7 restaurants and 96 bedrooms available to members there is, inevitably, a large amount of rubbish created, all of which requires hospitality waste management in Westminster that is out of sight from the guests. As a result of the huge waste operation that is happening behind the scenes at the RAC Club, the club has invested in a full-time waste management supervisor. This person, in understanding the waste types created, works to exceed the sustainability agenda set by the club. This ensures that all waste is segregated correctly and managed in the most environmentally friendly way possible. The club’s storage area is located in the basement of the club, which has a small lift that is only able to carry 2 bins at a time. As such, the club value the Commercial Waste team’s assistance in getting the waste out as quickly and discreetly as possible. Noise has to be at an absolute minimum in the relaxing surrounds of the RAC club, so noisy collections such as glass are only made during sociable hours. With the RAC Club hosting lots of events and being home to VIP guests, flexible collection times need to be agreed in the case of certain situations. All waste types were often taken together and therefore leading to contamination of recyclable materials. The sub-contractors would use old vehicles with open caged stillages into which the waste was thrown. This didn’t meet the levels of quality and discretion that the RAC Club preferred. The way food was collected caused risk of bad smells, staining and infestation. Receiving recycling reports that didn’t seem to reflect the practices observed. 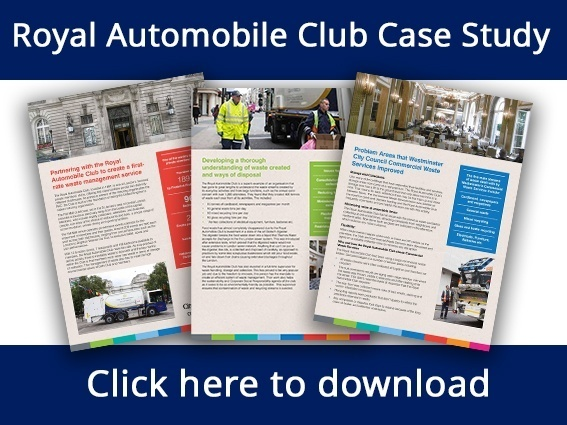 High-quality hospitality is central to The Royal Automobile Club and as such high-quality waste management services are paramount to their operations. This will remain a key focus point for future developments within the famous institution. To download a copy of the case study simply click on the image below and take a look in more detail at everything that has been achieved.